The GSU library can help you manage your working data, write data management plans for grants, and make your data accessible for future researchers. 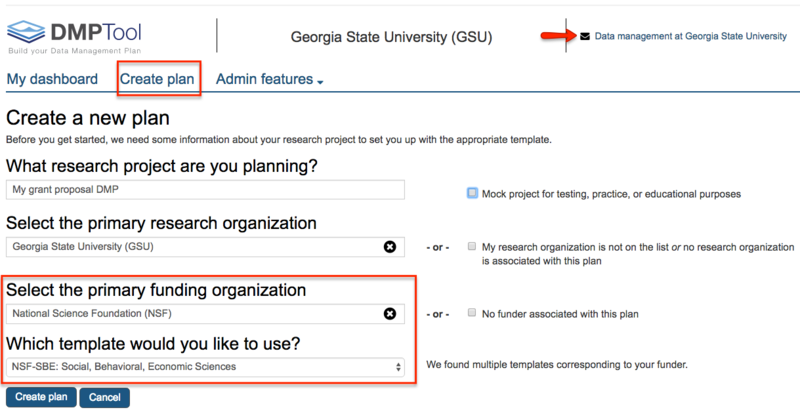 On the DMPTool site, click Sign In, click Option 1 "Your Institution" button, type Georgia State University (GSU) in field, and click Go button. You'll then be routed to GSU's login page - login with your CampusID and password. You'll then be routed back to the DMPTool and signed in. Click the Create plan link or button to start a new DMP. Select the appropriate primary funding organization for the grant, AND, if applicable, specific directorate within that funding organization to make sure you are including the required headings/sections for that directorate. Why have a Data Management Plan? Your grant funding agency requires one. You want your data to be well-organized during and after your research project. You want other researchers to be able to discover, reuse, and cite your data, which is another measure of your scholarly impact. You want to be transparent about your research by sharing your data and analysis process so others can replicate your findings. You want your data to be preserved and archived. Writing a Grant and Need Boilerplate Language about Library Resources?